Vietnamese desserts stand out amongst most other sweet dishes worldwide because of the unique, out-of-the-box ingredients added in preparing them. Those having a sweet tooth along with the desire to explore a variety of delicacies would find extreme delight in trying out these beverage in Vietnam. Let us check out the list of the most tempting desserts which would prompt you to do away with your dieting goals. 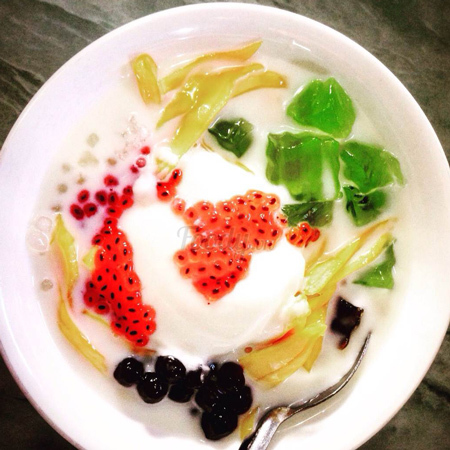 A yummylicious dessert soup made from mung beans and coconut milk, serves as a refreshing treat during summer because of the cooling properties of green mung beans. However, you can even have it as a warm soup during the chilling winters. This gooey, sweet dessert is served hot and usually topped with white sesame seeds. The chewy, glutinous rice ball is stuffed with mung bean paste and cooked in a fragrant ginger syrup. Chè Trôi Nước roughly translates to “fulfilment” and this dessert is often eaten on a child’s first birthday and other traditional holidays such as Tet, the Vietnamese New Year. The saying “don’t judge a book by its cover” definitely applies to this dessert. From first glance it doesn’t look like something you’d be eager to ingest; it is a thick, black syrup usually sold by street vendors. It gets its colour from the main ingredient – black sesame seeds – and is not overly sweet. It has a rich, toasted sesame taste and is normally eaten as a mid-afternoon snack in Hoi An. Portions are small, served hot, and contain the herb pennywort, which is said to have strong healing properties. Don’t shy away from Xi Ma – buy a small cup and enjoy the unique flavour. Bánh Da Lợn (Steamed Layer Cake) Bánh da lợn may be translated as ‘pig skin cake’ in Vietnamese, but it’s actually a steamed layer cake with a gelatinous texture that’s akin to pig skin (hence the rather unappetizing name). Made from tapioca starch, rice flour, mashed mung beans, taro, coconut milk, and sugar, each layer comes in contrasting colours, commonly in green and yellow, for an eye-catching ensemble. It’s also a filling snack to help tide you over until lunch or dinner, thanks to the rich combination of coconut milk, taro and beans. 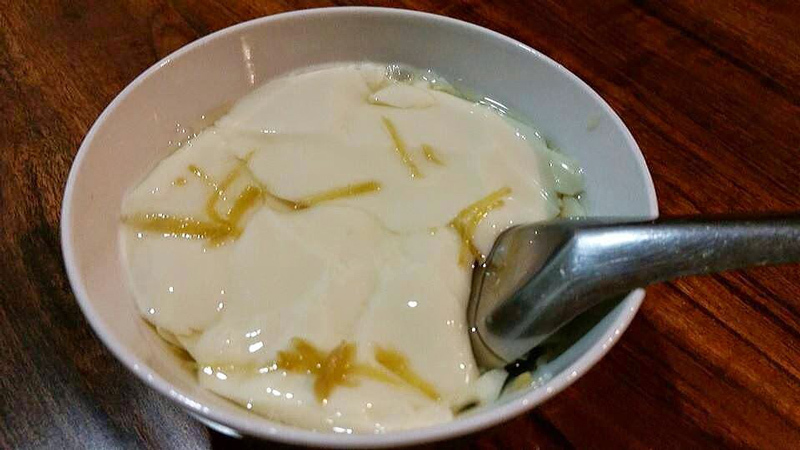 This can be seen in tàu hũ nước đường, which is a Vietnamese silken tofu dessert. There are many variations of this pudding across Asia but what makes this dish so special in Vietnam is the use of a spicy ginger syrup that is poured over the top. It is then topped with cubes of flavoured jelly. Salted or sugared dry fruit are a traditional and popular Vietnamese candy, especially during Tết Holiday (Lunar New Year). Hang Duong Street (Sugar Street) in Hanoi, is famous for Ô Mai, and the place to go to taste unique flavors made with family treasured recipes. The taste is a combination of salty, sweet, mixed in with the pungent taste of fresh ginger and natural fruit flavors. Some of the popular flavors are apricot, plum, kumquat, starfruit, mango, tamarind, ginger, sweet potato. Flavors based on condiments like chili, ginger, lime, licorice are also worth tasting. Light, refreshing with just the right amount of sweetness, you can find numerous dessert cafes in Da Nang selling rau cau trai dua (coconut jelly) especially along Bach Dang Street, facing the Han River. It’s served in a coconut shell (with its flesh still intact); its top layer is custard-like coconut cream while the bottom consists of jelly that’s made with coconut water. Rau cau trai dua is also a good dessert option for travelling vegans as the jelly is made from seaweed called agar-agar. Colour really makes this dessert stand out, topped with a layer of nuts and featuring colourful cubes of jelly and sago pearls.